When cooking, it is best when you can have everything in one spot without having to take up all of your counter space. You also don’t always want to crowd up your stove with pots and pans. This is why you should invest in a stainless steel electric griddle. You can just sit it on the counter-top and have everything you need in one spot. While using an electric griddle, you have the entire stove-top available for other things, while you are cooking on the griddle. Electric griddles are also a healthier option for cooking some of your favorite foods, because most of them have a way to drain the grease from the foods as they cook. Another benefit to an electric griddle is that it is also perfect for the disabled to cook on it as well because you don't have to be in the kitchen or see over the counter top in order to cook your favorite﻿﻿﻿﻿ foods. Sometimes, disabled people have trouble cooking for themselves because they cannot reach the stove or get into the kitchen on their own. This makes purchasing a stainless steel electric griddle a great investment for your family, regardless of the cause. When looking for an electric griddle, you should check the quality of the product you are buying, if it suits all your cooking needs and how well you like the design. You should also consider the size of the cooking surface, and if it will cook your food evenly. You don’t want a product that will only cook half of a pancake. Do you need just an electric griddle, or do you want a griddle and grill combo? Lastly, you should also consider the cost of the product you’re buying. If the product is outside your price range, then it's definitely off the list of possible purchases. Below are three very different stainless steel electric griddles by three different manufacturers. Each one has their own sets of pros and cons, and each of them would be great for any kitchen. 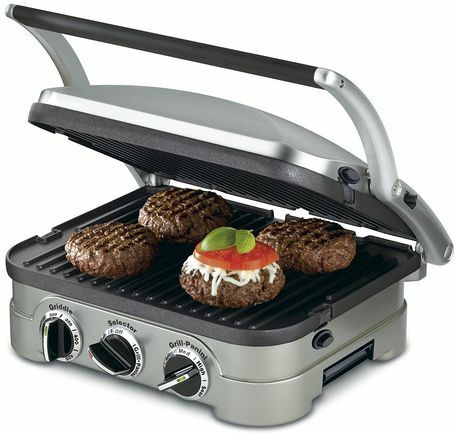 The Cuisinart Stainless Steel Griddler is an excellent product by the top of the line manufacturer, Cuisinart. It is of excellent quality, at an affordable price and loved by many people. It is easy to use and even easier to clean, making it perfect for people who are often busy and don’t have the time to stand over an oven for hours, or people who are trying to feed a large family and need it to be as easy as possible. • This stainless steel electric griddle has brushed stainless steel housing, so it will go with almost any kitchen design and you don’t have to worry about a finish chipping or peeling. • The cooking surface is eleven and a half inches by nine inches, and the temperature for each side can be controlled individually. There are two clearly marked knobs that have indicator lights that are used to cut the guesswork out of it. • This product has a panini-style handle to make handling easy. It also allows you to maneuver the lid to set in up in whichever cook style you want to use. You can use this device to cook in five separate ways. 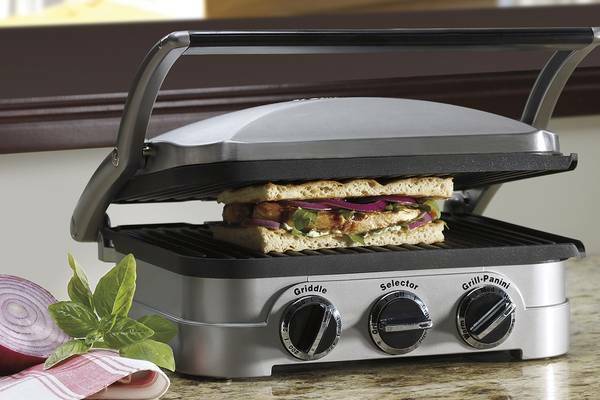 This product works as a contact grill, panini press, full grill, full griddle and as a half grill, half griddle. The cooking plates are removable and reversible, and comes with an integrated drip tray. This device comes with a limited three-year warranty, so that you don’t have to worry about a thing in the first three years of use. With the warranty, you don't have to worry about a thing and can depend on the customer service team to be there if you need them. It is not recommended to cook bone-in chicken on the grill top because it won’t cook evenly and may not cook all the way through. This stainless steel electric griddle has had complaints of it not cooking properly and of eggs dripping through the drainage hole like grease. 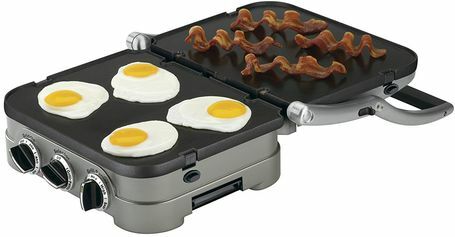 This griddle is highly recommended, and loved by most of the users who have purchased it. The controls are simple and easy to use. This product also has the ability to cook almost anything you could want to cook, which will take some of the cook time away from the stove. The different cooking styles will keep you from having to hunt down different pans in order to cook what you like. This product is the only one that offers a three year limited warranty so you don't have to worry, and will go well in any kitchen. 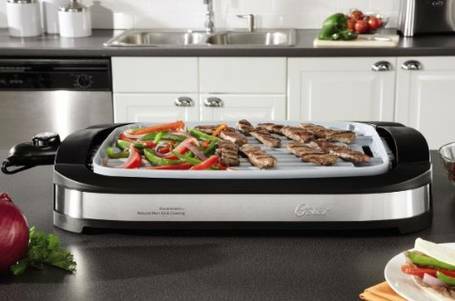 The Oster CKSTGR3007-ECO DuraCeramic Reversible Grill and Griddle is a wonderful product that will do loads for your cooking experience. It is one of few products that are designed with a nonstick ceramic coating so that you don't have to worry about a thing. This is one of the best electric griddles that you can get for less than one hundred dollars, and one of the only ones that will offer a Cool-touch designed handle so that you don't have to worry about being burned while moving the product. • This stainless steel electric griddle has nonstick ceramic coating that will heat up twenty percent faster, allowing you to save energy and start cooking faster. The cook top is Perfluorooctanoic acid (PFOA) and Polytetrafluoroethylene (PTFE) free, so you don’t have to worry about unnecessary health hazards from synthetic compounds. Given that PFOA is hazardous in drinking water, you definitely don't want to be cooking with it. • This product is brushed stainless steel, so it will go well with almost any kitchen design. • It comes equipped with cool-touch handles, so you don’t have to worry about being burned when checking your food. This makes it even more worry-free, and allows you to feel confident having your children helping you in the kitchen as well. • The cooking surface is eleven inches by fifteen inches, so you have plenty of space to cook everything you want to cook, without having to worry about it being too bulky. This device has a reversible cooking plate that has a grill on one side and a griddle on the other, so that you have plenty of options for what you want to cook and how you want to cook it. This product comes with a one year limited warranty that will cover defective components and will help you fix them, so you don’t have to worry during the entire first year. Unfortunately, there isn’t a cover or splatter guard that will fit this product, so you will have to understand when buying this product that you cannot cover the food.This would also somewhat limit what you can cook with this device, as some recipes require you to cover the food while it cooks. Many buyers have claimed that they have gotten products that do not heat evenly, therefore generally burning one side and under cooking the other side. These are believed to be defective products, and it is unlikely that every product would have the same defect. This product is one of few that has a ceramic coating to help the surface heat up and keep the surface non-stick for years to come. This will keep it both easy to use and easy to clean, and will take the stress out of cooking. This stainless steel electric griddle is perfect for anyone who would like a stress-free cooking experience and doesn't want to spend ages scrubbing a griddle clean. This product is one of the best devices available and will allow you to have a wonderful, unique cooking experience. 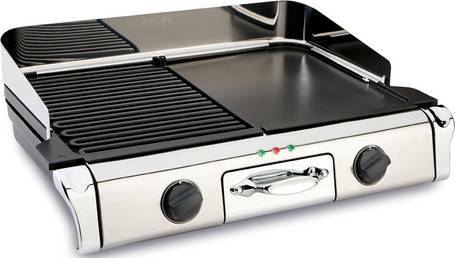 The All-Clad TG806C51 Stainless Steel Electric Griddle is an excellent product by a well-known manufacturer. It provides everything you need to cook whatever you would like on either its grill or griddle plates. It allows you to the ease of use you want, and the easy cleaning you need. Using this griddle will give you everything you need in order to be able to cook for the entire family. Cooking breakfast is loads easier when cooking it on an All-Clad stainless steel electric griddle. • This product has a polished, stainless steel finish and a non-stick surface so that it will go well with the style of your kitchen, and there is no need to worry about a difficult cleaning. All of the strain has been taken out of this wonderful product, making it all the better for you and your family. • The All-Clad stainless steel electric griddle includes two removable aluminum grill plates and an aluminum griddle plate so that both are lightweight and easy to clean. The embedded heating elements in each one has different thermostats, so you can cook each side at a different temperature, which is perfect for cooking different things at the same time. • This product has numerous preinstalled heat settings, including a Keep Warm setting (180 degrees Fahrenheit) and a Sear setting (450 degrees Fahrenheit). This will allow you to do everything from cooking, to keeping finished food warm. • This product is designed with nonskid feet to keep it in place while you are cooking. You don’t have to worry about the product slipping and sliding while you cook, and quite possibly burning you in the process. • It has a wide twenty-inch by thirteen-inch cooking surface, giving you a good bit of space to cook whatever you want, and also making it the largest cooking surface on our list. This stainless steel electric griddle can be used as a full griddle or a half griddle, giving you plenty of cooking options. It allows you to cook different things, in different ways, at the same time without having to hunt for a new pan to do so. This griddle cooks evenly and efficiently, taking the worry out of cooking. You don't have to worry about your food cooking unevenly while using the All-Clad stainless steel electric griddle. 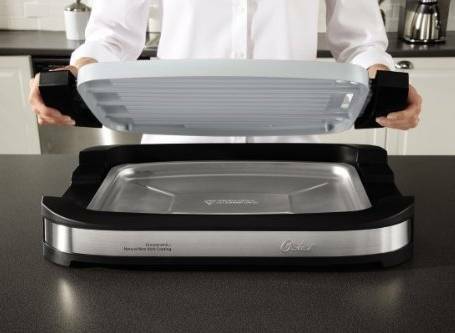 This griddle has a removable splash guard and drip tray that is dishwasher safe, making cleanup a breeze. To make things even easier, it includes cleaning tools for the griddle in the box. In some cases, the heating mechanism on the griddles have gone out. These may simply be faulty products, and a resolution could be found by contacting customer service, who may be able to supply you with a new heating element for the griddle. This griddle will also get very hot on the outside of the product, so you should keep this in mind during use so that you don't burn yourself. Needless to say, this also makes it unwise for children to play around near this device while it is on. Granted, we normally don't allow children to play with hot cooking pans, so the statement itself is likely redundant. This device is one of the more expensive electric griddles, at nearly three hundred dollars, and seems to be a useful product, leaving exceptions for the devices that have malfunctioned. In total, however, this is a wonderfully designed product and still has a decent recommendation rate. This product would be an excellent addition for any kitchen and great cookware for any family. When looking to buy a stainless steel electric griddle for your home, there are several things to consider. Listed above are three of our most recommended products for any home, and with any luck, they will be perfect for your home too. Keep in mind that when buying an electric griddle, there are several things that you have to think of in order to make sure that you are getting the perfect product for you and your family. Any of the three stainless steel electric griddles on this list are wonderful additions to any kitchen and any family size. Any of the three products listed above will be excellent additions to your kitchen and your home. You will be able to cook large meals for your family, without the hassle of cooking on a stove top. You and your family will benefit from purchasing a stainless steel electric griddle, and cooking in your home will never be the same again.